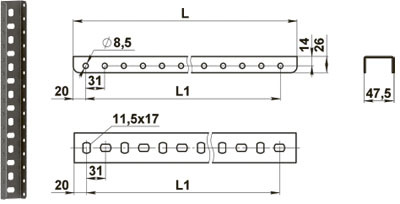 Designed for mounting of trays on a "U" section to the ceiling with studs. "U" section 100 180 155 0,23 2643060 шт. "U" section 200 242 217 0,32 2645060 шт. "U" section 300 366 341 0,48 2646060 шт. "U" section 400 490 465 0,64 2647060 шт. "U" section 500 552 527 0,72 2648060 шт. "U" section 600 676 651 0,87 2649060 шт. "U" section 2000 1990 1953 2,64 2640760 шт. "U" section 3000 2990 2945 3,95 2640860 шт.